So you want to start watching anime? My brother first introduced me to manga when I was about 11 or 12 and I fell in love. The art was a unique breed of comic I'd never seen before, and the animated version was even cooler. It sparked my love for Japanese culture and I'm even attempting to teach myself Japanese as a result. A lot of people have asked me for some recommendations, because they want to get into it, but don't know where to start. So I thought today I'd show you a few of favourites to kick off your inevitable addiction to anime. This one's a more conventional facet of anime that you have most likely come across at some point. Studio Ghibli is essentially the Japanese Disney. Their films are imaginative and beautiful, with colourful characters and whimsical worlds. My personal favourite is Howl's Moving Castle, but I'm also a lover of My Neighbour Totoro and The Wind Rises. A question you'll have to ask yourself with anime - it's in Japanese, so English subtitles or dub voices? Normally I'll say the former, because in my opinion the authentic Japanese voice is part of the character. However Studio Ghibli is an exception to the rule as they tend to hire decent voice actors, which aren't all female and/or incredibly cringey. Fairy Tail to this day is my favourite anime. It follows a group of young wizards who all have magic powers. In the kingdom of Fiore, there is a famous wizard guild called Fairy Tail, known for its destructive antics and skilled fighters. Lucy Heartfilia, the female protagonist, is invited to the guild by a Dragon-slayer wizard called Natsu. 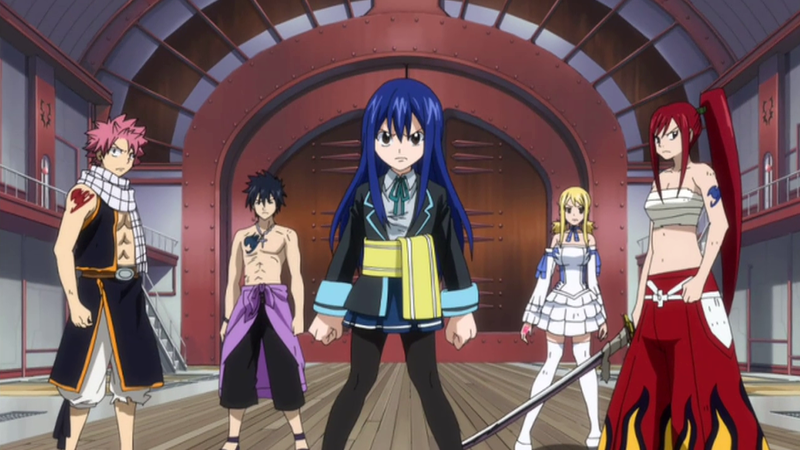 The Fairy Tail members each have their own unique power and quirky personality, creating these really lovable characters. The anime follows their magical adventures and has excellent plot twists. You need to invest a bit of time, as it takes a few episodes to get interesting, but it's worth it. Oh and my favourite character is Happy, a talking blue cat who can fly. 100 years prior to the beginning of the story, a species of giants known as 'Titans' almost wiped out humanity. The Titans can't reproduce and don't need food to survive but will instinctively attack humans. A small portion of people survived and they created a town with three huge walls to protect them. The town has lived in peace for 100 years until a huge 200 foot tall Titan breaks the wall. The story follows Eren Yeager and his adopted sister Mikasa. Eren decides to join the 'Survey Corps', a police force who go outside the walls and fight Titans. The plot line is unconventional, yet gripping and the animation is truly stunning. This was the first anime I ever watched. It is a great introduction to the romance side to anime, as almost every series has a love interest as part of the plot. Anime romances are pretty different to regular TV, and tend to be much more amusing. It's a silly, almost satirical humour usually centred around unrequited crushes, but you can't help but love it. Kaichou wa Maid-sama follows Misaki Ayuzawa, the female President of a newly turned co-ed school. She hates all boys and focuses her life on turning her school around to be a more welcoming environment for girls. Takumi Usui, school 'dreamboat', finds out the secret that she works in a Maid cafe to help her family. The anime kind of just follows their interactions and relationship and it's just funny and light-hearted. The Brotherhood series of Full Metal Alchemist follows the story of the original manga, not to be confused with the other version based on a TV series. This is probably one of the coolest fantasy series I've watched. Brothers Ed and Al grow up with an Alchemist father and their mother in a small town. Their father leaves home when the boys are very young but they decide to take up alchemy. When their mother falls ill and passes away, they attempt to bring her back to life. Human resurrections are taboo and never work, so in this haunting scene, Al's body is obliterated and Ed loses his leg. In an attempt to keep his brother alive, Ed sacrifices his arm in exchange for Al's soul, which he summons into a suit of armour. Ed, with his automail prosthetics, and Al, inside a suit of armour, go on an alchemy quest in search of the Philosophers stone. Their adventures are thrilling with evocative and melancholic undertones. There's a diverse range of animes to get you started. Writing down this list has made me realise how creative manga really is. The plot lines are so great and it's pretty impressive that you end up feeling so much compassion towards an animated character. Let me know in a comment if you've seen any of these or what your favourite anime is! p.s. Apologies for the slight blogging-break. I just returned from my MUN conference, and I'm finally off school. I'm going skiing tomorrow so look forward to some good content! The story is at the heart of all successful anime. In japan it seems the people point to the director and will follow anime based on whom the director or studio is. The vampire anime list have huge story and seasons are packed with great storytelling and animation.